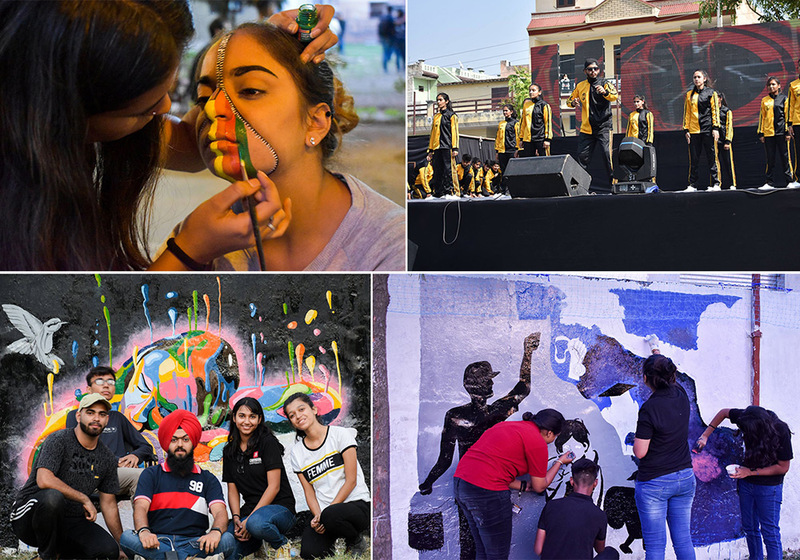 Chitkara University students made a clean sweep at the annual cultural fest Zeitgeist 2018, at IIT Ropar, in a myriad of events. Students bagged the first position in five events including Wall Graffiti, Rangoli Making, Face Painting, Folk Dance and Rap Battle; second in Instrumental Competition and third in Solo Dance Competition. Chitkara University teams – Bhangra Regiment, Reflection and Dhwani, ruled the hearts of everyone with their spectacular performances at the event. More than 60 events, with a footfall of around 20,000, the event saw star-studded Pro Nights, Fun Events like paintball, Prom Nights, Bonfire; Lifestyle Events like Mr. and Ms. Zeitgeist, Lashkara Fashion Show; Dance Events like Street Battle, Groove-Z; Music Events like War of Bands, Capricio; and Photography Events like Shutter Up, Pic of the Day.